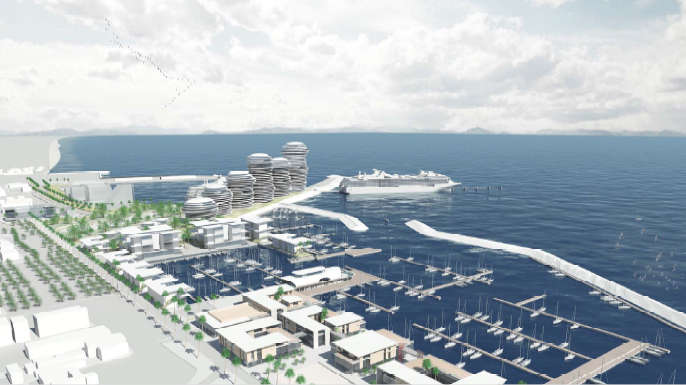 The Ministry of Transport has unveiled its new plan to attract a strategic investor for the development of the Larnaca port and marina and includes berths for Giga yachts and cruise ships. The plan analyses in detail the present conditions as well as the legal, economic and technical issues for the proposed development framework. The study was undertaken by ERNST & YOUNG and SALFO and presents three different development strategies with investments ranging from €145 million to €235 million. According to the report, the present infrastructure of both the port and marina are in poor condition, and major restructuring will be required. The study proposes the substantial revision the city plan to facilitate the development of projects desired by both the state and the city council and has suggested increasing the building coefficient from 30% to 40%. The study has outlined the need for a suitable road network which will connect to the existing one but with priority given to pedestrians and easy access to the Phinikoudes promenade and bicycle lanes. Stay tuned for much more and learn more from ReLux Estates!